The text was there. It stated it would work. I’ve had a thread about this in Microsoft Communities http://answers.microsoft.com/en-us/surface/forum/surf2-surfnetwork/has-anyone-tried-the-surface-ethernet-adapter-with/ce61784e-a273-4fb5-98f2-a48b3a25a94f which Microsoft has ignored. 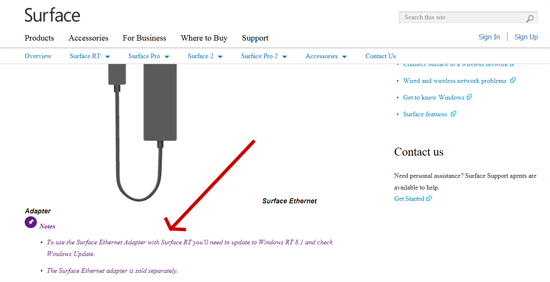 (Update: Microsoft has removed Surface RT and Surface 2 from the page, don’t despair, it DOES work, read on) However, if you were to update your device, purchase the Surface Ethernet adapter, plug it in, you will get the infamous message “Not Compatible with this version of Windows.” Even running Windows Update does not fix this issue, at least not at the moment. I did some digging and found that the Surface Ethernet adapter uses the Realtek chipset and I noticed that in the Devices section under network adapters Windows RT now has a Realtek USB FE Family Controller driver. 1.Plug in your Surface Ethernet Adapter, wait for the installation to fail. 2.Then open Device Manager, under Network Adapters right click on the Ethernet Adapter, it should have a yellow exclamation mark. 3.Choose update driver, then select Browse my computer for driver software. Then click “Let me pick from a list of device drivers on my computer”. 4.If it doesn’t take you directly to Network Adapters, choose it from the list. In the left pane your should see Realtek, highlight it and you should only have one option in the right pane for the Realtek USB FE Family Controller. Select and next. 5.If it warns you about compatibility just accept it. The driver will install and you will have 10/100Mbps Ethernet on your Surface. Only 1 year late, but who really noticed?